Those of us who have been part of the workforce long enough remember the roach coaches that stopped at our places of employment during breaks and lunchtimes. Today, when referring to food trucks, calling them roach coaches is a definite no-no. Food trucks now embody local, gourmet, culturally inspired edibles more reminiscent of a sit-down restaurant than a rolling box truck. The food truck phenomenon, as it’s called, is believed to have gotten national recognition when Los Angeles’ Kogi BBQ truck was opened in 2008. News of its success spread cross-country, and box trucks became a hot commodity on the re-sale market. What’s not lost on those in the food industry is the timing. The growth of the food truck nation coincided with the downturn of the U.S. economy that saw food preparation professionals facing an unemployment line. Instead of giving up, they saw a means to share their culinary expertise with a hungry public, one seemingly always in a hurry. Ibisworld.com reports that there are more than 4,000 food truck businesses nationwide that employ nearly 15,000 people. With an annual growth rate of more than 9 percent, the industry is still viewed as a small piece of the food industry pie. This stems from both a low rate of employment – given the nature of the food truck operational set-up – and the “unfavorable regulatory conditions in some cities (that) have limited the growth of industry vendors,” the site says. Cities that do have ordinances put them in place to regulate the trucks’ pollution (trash), parking, health codes and proximity to residential neighborhoods. And some municipalities require festival permits or temporary use permits to conduct food truck events on occupied commercial property. Cabarrus Magazine spotlighted The Pig & Cow Inc. back in August 2013. 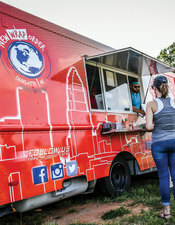 As the county’s first food truck, it promoted relationships with local farmers and produce markets as well as the hope of a cohesive food truck community. While that particular business was sold and moved out of Cabarrus County, that “community” has taken shape. Greg Helmandollar is co-founder of Cabarrus County Food Truck Friday. He’s a familiar face in the area, having been co-owner and chef at Union Street Bistro. At the same time – in 2013 – he and his father-in-law started Masterbacon, a patriotic-looking food truck labeled as a bacon response unit; both men had been in the military. Meant to bring in some extra money, the truck became so successful that Helmandollar was forced to make a choice. “I had to make a decision to keep the truck or the Bistro, and I kept the truck. We hit the ground hard,” he says. Masterbacon made appearances at Charlotte’s growing Food Truck Friday, but that event booked up quickly so Helmandollar’s exposure was limited. He also found people asking why he didn’t set up a similar event in Concord. Helmandollar announced the local Food Truck Friday on social media to gauge interest. He brought in 12 trucks the first time they set up, usually have about 12 now, and that number seems to work. “A lot of people don’t understand. If you have too many trucks and not enough customers, or not enough trucks and too many customers...we average 1,500 to 2,000 people each Friday, depending on other events in the county and the weather,” he says. Because Cabarrus’ event has grown so quickly and because Helmandollar is now owner of Crispy’s Bar & Grill, he can’t handle both anymore and knows it isn’t fair to try. So he has handed the operations of Food Truck Friday over to Lisa Banis, wife of co-founder, Jimmie Banis. She coordinates the trucks participating each week and keeps up with the Facebook page, the event’s mode of promoting trucks and advertising itself. While Harris Morrison Company does charge Food Truck Friday to rent its property, no ordinances or permits are currently required. Each food truck owner kicks in money to cover costs, which also typically include a DJ and various kids’ activities. “I just have to make sure the trucks are current with their health permits,” Banis says. In addition, because of its present location (Helmandollar sees them outgrowing it), businesses within the Old Creamery building can participate in the weekly event. Cougar Run Winery stays open to serve its well-known wine slushies to the adults. Flavors vary weekly and may include peach, sangria, margarita, raspberry and lemonade. The Peachtree Market is open until 6:00pm on Friday nights and specializes in local produce, meats, eggs, cheeses, bread, honey, etc. So, what can be so tasty that it brings out thousands? 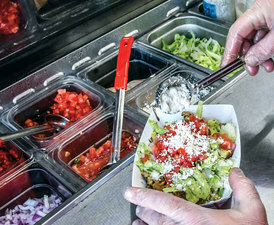 The dominant draw to food truck events is the variety of original menu items, and the National Restaurant Association surveyed about 1,600 professional chefs last fall – members of the American Culinary Federation – asking them what types of foods, beverages and practices they view as being the most sought-after. The top 20 food trends from the What’s Hot 2016 Culinary Forecast are: 1. Locally sourced meats and seafood; 2. Chef-driven fast-casual concepts; 3. Locally grown produce; 4. Hyper-local sourcing; 5. Natural ingredients/minimally processed food; 6. Environmental sustainability; 7. Healthful kids’ meals; 8. New cuts of meat; 9. Sustainable seafood; 10. House-made/artisan ice cream; 11. Ethnic condiments/spices 12. Authentic ethnic cuisine; 13. Farm/estate branded items; 14. Artisan butchery; 15. Ancient grains; 16. Ethnic-inspired breakfast items; 17. Fresh/house-made sausage; 18. House-made/artisan pickles; 19. Food waste reduction/management; 20. Street food/food trucks. To go along with local trucks’ efforts, Banis works at ensuring Food Truck Friday is a well-rounded, family-friendly event. Big Pop Productions brings the music, there’s face painting, hoola-hoop contests, dancing, and now trucks with different themes. Mobile boutique Dress Like a Girl is one. Banis also does fundraising for locals battling medical crises. Patrons are asked to bring lawn chairs, and dogs are welcomed as long as owners pick up after them. 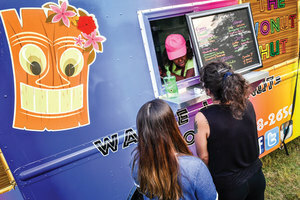 Additionally, Banis and Masterbacon are organizers of the food truck rally that is part of the Kaleidoscope Cultural Arts Festival series held in Kannapolis. Five food trucks join artists, musicians, poets and jewelry makers, etc., downtown. The next festival is scheduled for September 26. “I didn’t think we’d reach 10,000 likes on Facebook; I didn’t think it would have grown this fast in Concord,” Helmandollar admits. But these food truck owners are serious about their business endeavors. Many cater and some already own brick & mortar establishments, while others are looking to put their products – like sauces – into grocery stores. They are from a variety of North Carolina locations and travel to wherever the food truck events are. This is not viewed as a passing fad, and new markets and opportunities continue to present themselves. These colorful trucks with the uber-creative names are hired for business functions, weddings and parties. Want to go? Cabarrus Food Truck Friday is held from 5:00 to 9:00pm each Friday at 363 Church Street N., in Concord, behind The Old Creamery at Church and Peachtree. Banis can answer any questions truck owners or patrons might have about the event. Visit facebook.com/CabarrusFoodTrucks for more information.